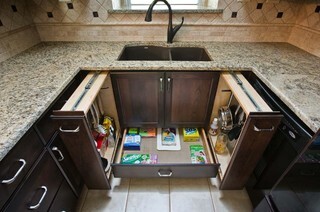 Looking for some smart ideas to organize under the sink? 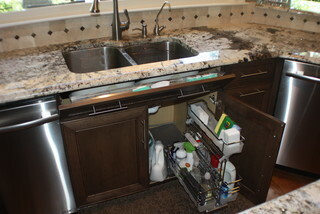 Despite the best of intentions, under the sink cabinets in the kitchen and bath easily become a disaster zone. Take back that space! Conquer the clutter with these clever tips. The key to an organized cabinet under the sink it keeping everything within reach. 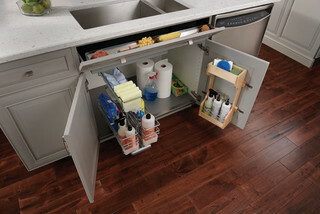 Rolling drawers make it simple to retrieve items stored in the back of the cabinet. Give the things used daily a prominent spot, and store everything else grouped together. Side out drawers combined with a door rack provides well-organized storage. The door rack puts items used daily at your fingertips and the slide-out drawers let you easily see what’s inside. Many clever ideas can be found on Pinterest to store and dispense grocery bags. Don’t have the time to DIY? Simplehuman has a stylish solution. Illuminate the area with battery-operated, stick-on lights. Designing a new kitchen? Consider a solution such as the one below which places everyday items easily within reach. Need help organizing your space? Eye4Design provides solutions to keep your home tidy and clutter free.